To declare information technology sector a prioritized sector. To prioritize research and development of information technology. To provide Internet facilities to all Village Development Committees of country in phases. To render assistance to education institutions and encourage native and foreign training as a necessity of fulfilling the requirement of qualified manpower in various fields pertaining to information technology. To computerize the records of each governmental office and build websites for them for the flow of information. To increase the use of computer in the private sector. To develop a physical and virtual information technology park in the various places with the private sector's participation for the development of information technology. To establish a National Information Technology Center. To establish a national level fund by mobilizing the resources obtained from Government, donor agencies, and private sectors so as to contribute to research and development of information technology and other activities pertaining to it. To include computer education in the curriculum from school to broaden its scope. 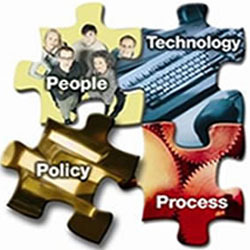 Information Technology Policy declare information technology sector a prioritized sector. Information Technology Policy create a conducive environment that will attract investment in the private sector, keeping in view the private sector's role in the development of information technology. Information Technology Policy use information technology to promote e-commerce, e-education, e-health, among others, and to transfer technology in rural areas. Necessary facilities shall be supplied to universities in the country and graduate and post graduate-level classes of international standard in computer science and computer engineering subjects shall be offered. List any four information technology strategies of Nepal adopted to accomplish the above objectives. The government will acts as a promoter, Facilitator and regulator. Carry on research, develop and expand It with a high priority for participation of the private sector. What is an information technology policy? The policy formulated by the government or concerned authority to organize, develop and implement in different sector of IT systematically is known as IT policy. Which of the following fall under policy of IT 2000? What can we do to increase the use of computer in a private sector? Encourage people not to use computers. Which of these is not the policies regarding information technology? To prioritize information found found from field research. Any Questions on 'Information Technology Policy '?